This creamy dish mixes fresh green beans, parmesan cheese and lemon juice with Knorr® Rice Sides™ – Herb & Butter to create a perfect balance of flavors. 1 SEASON chicken, if desired, with salt and pepper. Heat olive oil in large nonstick skillet over medium-high heat and cook chicken, turning once, until golden and thoroughly cooked, about 5 minutes. Remove and set aside. 2 COOK garlic in same skillet over medium-low heat, stirring, until fragrant, about 20 seconds. 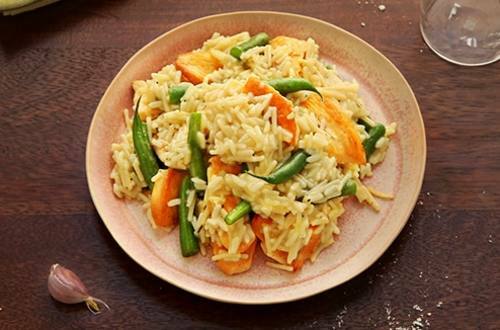 Stir in 2 cups of water, Knorr® Rice Sides™ - Herb & Butter and green beans* and cook according to package directions. 3 STIR in Parmesan cheese, lemon juice and chicken; let stand 2 minutes. Sprinkle, if desired, with additional Parmesan cheese.